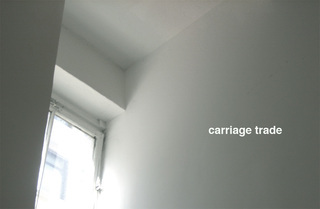 Through presenting primarily group exhibitions, carriage trade will function not as a means to promote the careers of individual artists, but to provide contexts for their work that reveal its relevance to larger social and political conditions prevalent today. A project of the artist / curator Peter Scott, whose exhibitions have attempted to highlight this relevance over the value of any given artist's work within the hierarchy of the art market, these projects will intentionally combine well known with lesser known artists, and historical pieces (60's, 70's, 80's) with very recent work. 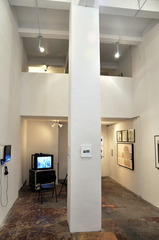 Originally influenced by the approach of magazines like The Baffler and Harper's which combine fact based readings with editorial commentary, Scott's curatorial approach often integrates relevant found material as a means to broaden the scope of an art exhibition by positioning the "evidence" of everyday experience in direct relation to an artist's mediation of social conditions. Some themes to be addressed in upcoming shows include issues of propaganda in mass media, the effect of neo-liberal policies on the built environment and social relations, as well as the concept of "mistaken identity" and likeness within the realm portraiture. The location of Soho, a neighborhood that could be seen as a now historical model for the intense gentrification taking place in cities everywhere, provides an appropriate setting for addressing the cyclic nature of urban transformation, (Soho enjoyed a previous incarnation as a high-end shopping district in the mid -1800's during America's Gilded Age) due to seismic shifts in economic relations.